Our very own Emily Hope is a finalist in the Durham Tourism Superstar 2018 and voting is now open! 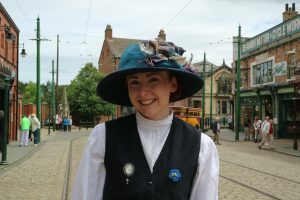 Emily, who works at Beamish’s Entrance, is “honoured and humbled” to be among five people shortlisted for the award. The winner will be decided in an online public vote, which closes at midday on Friday, 13th July. With her beaming smile and friendly nature, Emily greets visitors with the warmest of welcomes, always going the extra mile to ensure everyone has an amazing day out. No two days are the same and, during her time at Beamish, Emily has done everything from shovelling snow, taking part in Suffragette marches and directing traffic, to dancing at our Festival of 50s, processing tickets at the tills, helping reunite lost visitors, carving hundreds of Halloween pumpkins and rolling up her sleeves to wash dishes. She is also a Dementia Friends Champion and has trained more than 100 Dementia Friends among staff, volunteers and community members, to help make a difference to people living with dementia and their families. Emily, Project Officer: Entrance Development, said: “I am absolutely over the moon to have been shortlisted for Durham Tourism Superstar! I feel so honoured and genuinely humbled to have been nominated. “Beamish really is the best team to be a part of and I cannot thank them enough for all of the support and kindness they have shown to me since day one. “I wholeheartedly love my job and enjoy meeting new people every single day and to have been nominated because of that really does mean the world to me. “I love nothing more than chatting to visitors and finding out about their day or telling them where all of the best places are to visit in Beamish (there are lots!). Durham Tourism Superstar, run by Visit County Durham, working in association with the Northern Echo, aims to showcase the best in customer service. Other finalists are: Leanne Jeffrey, General Manager of Kingslodge Hotel, Durham, Angela Pickering, volunteer at Tanfield Railway, John Fraser from Castle Coast Campers Limited and Gary Lintern of Gary Lintern Photography. The winner will be announced at Visit County Durham’s annual garden party in July. The award recognises the dedication and passion of those working in Durham’s tourism industry and is given to someone who goes “above and beyond the call of duty to ensure visitors to Durham have a priceless experience”. Rhiannon Hiles, Beamish’s Deputy Director, said: “We are so pleased to hear that our own Emily Hope has been shortlisted for the Durham Tourism Superstar. Emily is amazing with boundless energy and infectious enthusiasm and really sums up what a Beamish welcome is all about. Beamish is hoping to continue its Tourism Superstar success. Matthew Henderson, Remaking Beamish – Engagement Development Officer, was the first Durham Tourism Superstar in 2014 and went on to be named national winner of VisitEngland’s Tourism Superstar in 2015. Dorothy Carlyon, who was Town and Pit Life Team Leader, was a finalist in last year’s Durham Tourism Superstar and Anthony Gales, Head of Site Support & Security, was a runner-up in the national Tourism Superstar award in 2013. We’d be ecstatic if Emily was crowned Durham Tourism Superstar 2018.